Located in the Bay of Samana, in the Dominican Republic, El Parque Nacional Los Haitises is one of the most beautiful areas in the island. Declared a national park on June 3, 1976, the reserve features gorgeous rocky and sandy mountains, hills, and valleys as well as mangroves, rivers and rich flora. The Dominican Republic may have suffered through long decades of cult-of-personality leadership under the presidents Trujillo and Balaguer, but the egotistical despots did at least have a solid streak of ecological protectionism. (One Dominican described it to us as them not wanting anyone else to spoil their own backyard.) The Parque Nacional Los Haitises is a stunning testament to this. Haitises National Park in the Dominican Republic is also a center for ecotourism adventure, where you can enjoy various activities like taking a tour boats that travel among the mangroves. Stunning landscape elements in the park include Cayo de los Pájaros (Bird Key), a colony of pelicans. The park is the habitat for many other species of native and migratory birds. 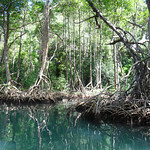 El Parque Nacional Los Haitises can only be visit via boat or via organized weekend rides. Boats depart regularly from Samana. 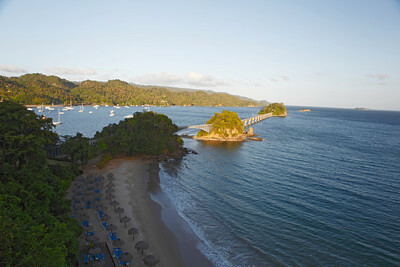 Los Haitises sits opposite the beautiful Samana Peninsula.